The main focus of the research group is the study of the pathogenesis of cervical artery dissection, a rare cause of ischemic stroke. In collaboration with colleagues from Basel, Brescia and Lille, the international CADISP (Cervical Artery Dissection and Ischemic Stroke Patients) consortium was initiated to explore the epidemiology of cervical artery dissection and to recruit large study samples for genetic analysis. In Heidelberg, analyses of Copy Number Variation (CNV) and of rare exome variants (EV) are currently being performed (Grond-Ginsbach Curr Genomics 2017). The results indicate that a polygenic burden of rare genetic variants across a variety of genes involved in arterial connective tissue syndromes contributes to the risk of arterial dissection. Moreover, the CADISP consortium identified a protective allele of the PHACTR1 gene that is common in the European population (Debette Nature Genet 2015). The methodology of CNV studies, particularly the detection, mapping and validation of CNV findings in noisy clinical samples, is of special interest of the group (Ginsbach Microarrays 2013). A second focus is on predictors of functional outcome after ischemic stroke. In collaboration with the International Stroke Genetics Consortium, the association of structural genetic variation with functional outcome after ischemic stroke of different etiologies was analyzed in eight study samples from different European and US stroke centers. High-density SNP microarrays were used for the detection of inbreeding and genetic imbalance. The data show a high level of inbreeding in the eight study samples, comparable to recent findings in the 1.000 Genomes Project. In our study population, stroke patients with related parents were more likely to have an unfavorable outcome. Analysis of young patients with ischemic stroke due to cervical artery dissection or other causes suggested that genetic imbalance was inversely associated with functional outcome after 3 months: The risk for unfavorable outcome appeared related to the number of deleted or duplicated genes. The relation was particularly clear for Copy Number Variants in genes related to inflammation. These findings in the CADISP study sample (about 800 young stroke patients) are currently being validated in the study population (n = 3.700) of the International Stroke Genetics Consortium. Analysis of various specific candidate biological pathways, including response to inflammation, will be performed subsequently. Future work will focus on cryptic relatedness and inbreeding on the Hardy-Weinberg equilibrium in genomic regions with common CNV and on complex structural variation in the human MHC-locus. 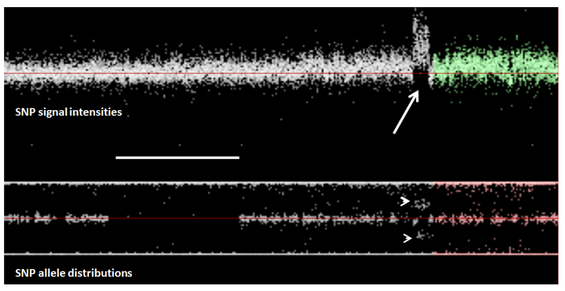 Visualization of microarray data (chromosome 10q and part of 11p). Upper panel shows signal intensities, lower panel shows allelic distribution of signals. Arrow points to duplication (increased SNP signals). Arrow heads point to SNPs with AAAB and ABBB signals – suggesting the presence of 4 copies. Bar indicates a large run of homozygosity in a genomic region with unchanged signal intensities – suggesting identity by descent due to parental relatedness (inbreeding).